I’ve never really enjoyed eating mushrooms, especially button mushrooms. I find them bland. The only time I will compromise using them is when they are combined with other ingredients. The one mushroom I can just about eat because it has depth and an earthy flavour is the chestnut mushrooms. I especially use it when I make mushroom stroganoff. I picked some up to enjoy at the weekend, but never go to eating them for breakfast. So I decided make some more soup. Yes I know, more soup already, but you will understand and forgive me, it ‘tis the season of soup. Now I must admit I was a little wary, as I have never liked mushroom soup from a tin, always finding the texture creamy, thick and a little sickly. But I do recall having had mushroom soup from scratch before and remember it being very light and deeply flavoured, so had no doubt this one would be satisfying, especially as it had a red chilli to spice it up. Ooh just the thought of it is warming me up and I was not disappointed. Oh before I rush off, please don’t substitute the mushrooms in this recipe with another, clues in the title. MethodIn a large saucepan, add the oil with the onion, chilli and garlic. Cook until the ingredients are soft. Add the mushrooms, thyme, tamari or soy and lemon juice. Cook until the mushrooms are just starting to soften. Looks so good!!!!!!!!! 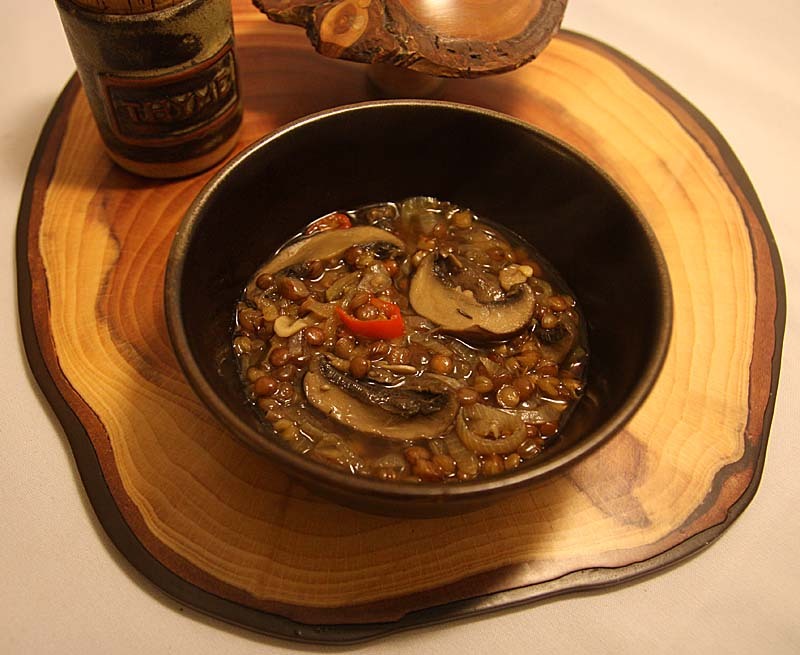 Mushrooms and lentils ... wow! I ate marvellous mushrooms in a B&B in Scotland. Even the kids (who are not very fond of mushrooms) loved them! Now, I've just come back from Rome with a big bag of dried porcini mushrooms... and was thinking of all the lovely things I could do with them. Your timely blog post has just inspired me. Thanks! I love the look of this, its my kind of meal. Really like how earthy and healthy it looks. I saw this last night, bought the chestnut mushrooms this morning, now I can't decide between the soup or the stroganoff. Did you ever get a dog by the way (you talk about it in your stroganoff post)? mmm, chunky chestnut mushroom soup, looks delish. I picked up a box of large flat mushrooms once at the end of market day and decided to make a soup with them. G called it 'black soup' (which it was) and while it tasted nice it was hard to get past the resemblance to something you'd find in a puddle under a car! so pleased to read that you have some good food memories of being in Scotland. Thank you so much green ink. I should have mentioned that i like wild mushrooms too and often use oyster mushrooms in Thai dishes, thought the texture is acquired. :) I do like them, as well as shiitake. Dreiod porcini from Rome. You lucky lady. Make a mushroom risotto too will be packed with flavour! Thank you so much. You right, it certianlyfelt healthy eating it too. So which did you dcide chestnut mushroom soup or stroganoff? Shame your version was not good enough to appear on the blog, but I am sure it was flavour-packed.